For me, the most significant and enjoyable movie awards of the year are the Spirit Awards (formerly Independent Spirit). 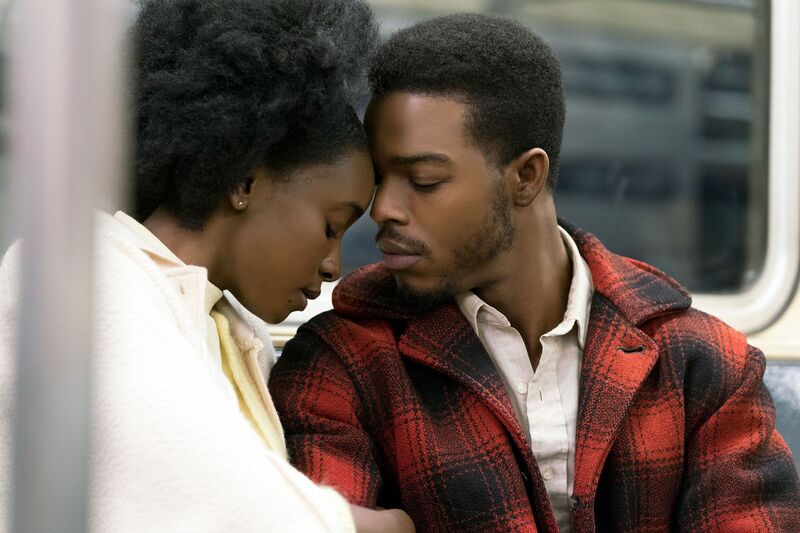 I was thrilled that my favorite film of 2018, “If Beale Street Could Talk” was selected for Best Picture, Director, and Supporting Actress. For generations, there have been children who have had more fun playing with the box than with the toy that came inside. The reason is easy to understand: a blank box puts no limits on imagination. It can be a clubhouse, a rocket ship, or a submarine, or all at once. It needs no batteries and there is no technology to break down. There’s no disappointing discovery that what looks cool on the commercial does not actually work. Cardboard can be anything and imagination can take you everywhere. 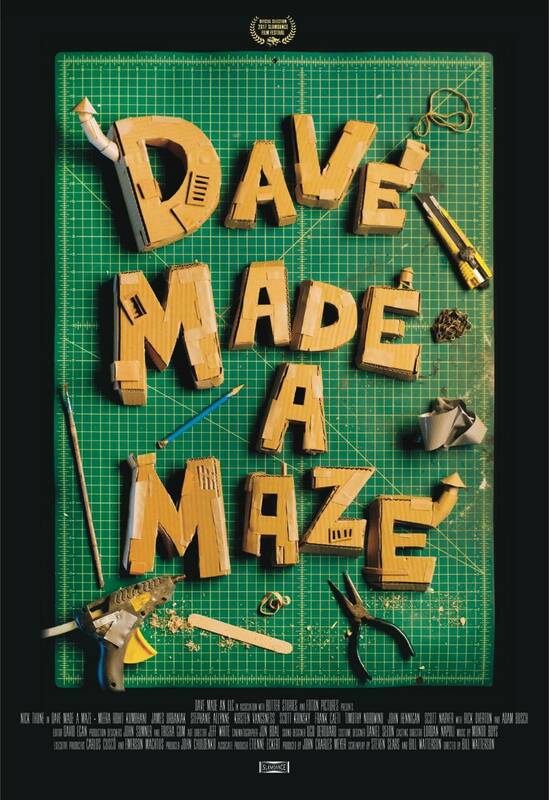 That is the theme of “Dave Made a Maze,” both the story on the screen and the story of the movie itself. Annie (Meera Rohit Kumbhani) comes home from a short trip out of town to find her boyfriend Dave (Nick Thune) has taken over their living room with a cardboard maze, or, rather, a labyrinth so intricate that he is literally lost inside it. Like the TARDIS, Dave’s construction is bigger on the inside. Annie grabs some friends and a box cutter and goes inside. A film crew led by their friend Harry (James Urbaniak) comes along to document (and sometimes shape) the adventure. Co-writer/director Bill Watterson (not the Calvin and Hobbes cartoonist) has created a slacker/artisanal “Cat and the Canary” or “Ghost and Mr. Chicken,” a comedy/horror film with real stakes and deadpan delivery, all the funnier for being so understated. The star of the film is unquestionably the maze/labyrinth itself. Production designers Trisha Gum and John Sumner, clearly having the time of their lives, worked with the genius artists of the Cardboard Institute of Technology to create an endlessly inventive world, enchanting, spooky, hilarious, and, when you don’t expect it, pretty scary. Just because the blood is made of yarn and paper, we learn, does not mean it is not real. On the other hand, one labyrinthian portal somehow turns the characters into paper bag puppets, a transformation which thankfully turns out to be temporary. Dave’s maze, a manifestation of his frustration at not having a job that fulfills him, turns out to have a malevolent sentience he and his friends have to battle. Having different artists work on different rooms and corridors adds to the continuous surprise and disconnect, with one section looking like a mock-up from “2001,” another sporting origami birds, and others playing with perspective and space. I was especially taken by the intricate cardboard mechanics underneath one space, with several others hinting at an even more expansive and complex cardboard world. 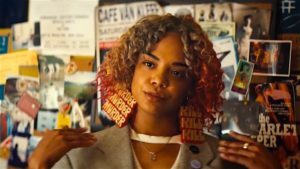 Part of the film’s charm is the way Annie and Dave’s friends immediately accept the premise and just go for it. But what makes this one of the most imaginative films of the year is the way it makes a virtue of its micro budget. Like Dave himself, the filmmakers have found what the cheapest materials can do better than the most sophisticated animation equipment. They’ve created a tactile environment that puts no limits on their imagination or ours. Parents should know that this film has very strong language, fantasy peril and violence, a monster, and characters who are injured and killed. Family discussion: Which was your favorite room in the maze? Why did the maze get out of control? Paterson (Adam Driver of “Girls” and “The Force Awakens”) lives in Paterson, the New Jersey home of Paterson Falls, and of poets William Carlos Williams and Allen Ginsburg. 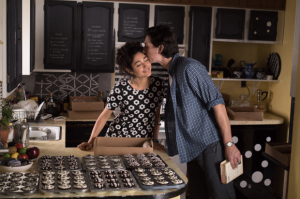 In writer/director Jim Jarmusch’s sweetest film to date, we see a week in the life of Paterson, a bus driver who writes poetry, mostly love poetry to his adorable wife Laura (a delicious performance from the beautiful Golshifteh Farahani), and in the life of his namesake home town. Each morning begins with Paterson and Laura asleep in bed, cuddling tenderly. He wakes up to what Laura calls his “silent alarm clock,” puts on his watch, nuzzles her gently, and gets ready for work. As we become used to his routine, walking to the bus depot with his lunchbox, lovingly packed by Laura, hearing the daily complaints from the dispatcher, listening to the conversations of the passengers, Laura’s imaginative dinners and wild experiments with design, walking Marvin the bulldog and stopping by the neighborhood bar for a beer, the smallest details become significant, whether reinforcing our understanding of his quotidian life or surprising us with its minor variations. Be sure to watch Marvin the dog for one of the film’s most delightful surprises. Driver is better known for anguished and intense performances, in “Girls,” as Kylo Ren in “The Force Awakens” and, 50 pounds lighter, as one of the priests in Martin Scorsese’s current release, “Silence.” It is a pleasure to see him here, thoughtful, sensitive, with a hint of a more traumatic past — note the photo on a bedside table, of Driver himself in his days as a Marine), but amused and pleasantly bemused by the world around him and unabashedly adoring his beautiful, devoted wife. I’m not sure I’ve ever seen him laugh before, certainly not with such evident pleasure, and it made me want to see much more of this side of him. While Paterson is contemplative and focused, considering words carefully as he walks, Laura is impulsive and enthusiastic, with new creative projects and inspirations all the time. 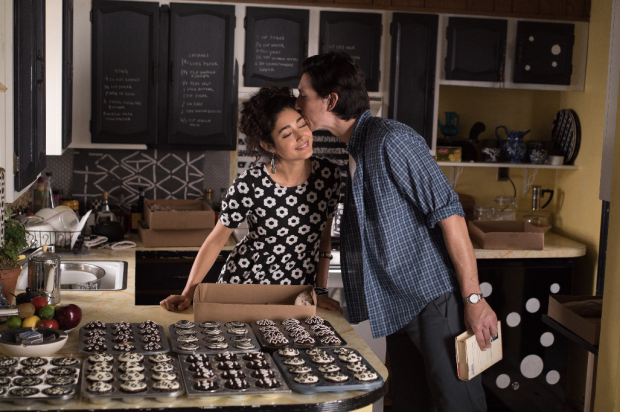 Each day, Paterson comes home to find that Laura has covered the rug or the shower curtain or her dress or cupcakes with op art-like geometric designs in black and white. When they go out to an old movie together, she winningly says she likes it because it is in black and white. Their support for each others’ creative projects is endearing, and their pleasure in each other and in each other’s pleasure is exquisite. Not much happens. There’s a mechanical problem on the bus, which Paterson handles responsibly, despite not having a cell phone. 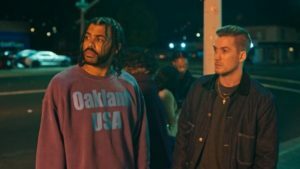 An unhappy customer at the bar creates a fuss, and Paterson intervenes quickly and capably, almost through sheer muscle memory from his military training, though it shakes him a little. 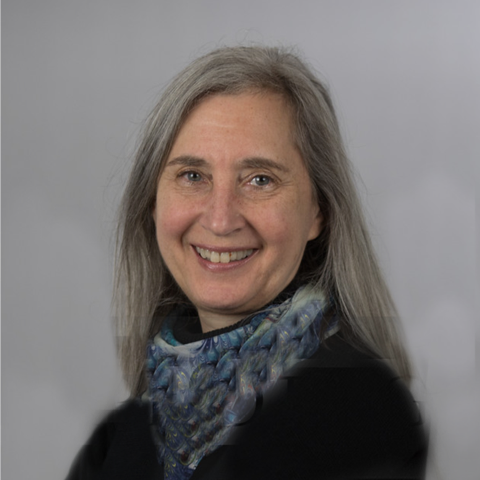 He happens upon three other poets, a spoken artist practicing in a laundromat (Method Man), a nine year old waiting for her mother and sister, and a Japanese tourist carrying a volume by William Carlos Williams. He compliments the young poet on her internal rhymes. It turns out the sister she is waiting for is her twin. The film itself is full of doubles and twins, including the matched names, a series of internal rhymes that match the lyricism and cadence of Paterson’s poems, written by Ron Padgett and his life, modest, diligent, precise, aware. We come away from the film filled with the alertness and engagement Paterson and Laura bring to their days. Parents should know that there is a brief scene with a gun, threatening murder and suicide, and some strong language and sexual references. Family discussion: Who is your favorite poet? How did Paterson incorporate what went on around him into his work? Why didn’t he want to make a copy of his notebook? Life is pretty much improv, after all. We are constantly challenged to respond to what we cannot predict. But we do not have the two foundational rules that make performance improvisation so compelling. First is “yes, and.” Whatever anyone on stage says or does, everyone else has to build on it. If someone says, “Wow, it’s cold in here,” no one is allowed to say, “What do you mean? We’re outside and it’s warm.” You have to say something that takes what the first person said to the next level, maybe “Yes, who turned the air conditioning down to 60?” Or even, “Well, there’s really no practical way to heat an igloo.” It is the high-wire without a net act of improv group’s lightning quick, sharply observed, and deftly funny scenes that audiences enjoy. The other fundamental rule is what improvers say to each other before they go on stage: “I’ve got your back.” Improv is about the group, not the individuals. “Don’t Think Twice” is the story of an improv group called The Commune, suggestive of its familial, interdependent, collegial quality. They are something like a family, if a dysfunctional one. While they have very different backgrounds and goals, the way they come together on stage is, at least for now, enough to make them feel they have a home together. The closest thing they have to a leader is Miles (writer/director Mike Birbiglia of “Sleepwalk With Me”), who is a little older and taught many of them. He is still teaching improv classes and often has brief affairs with the young women who are his students. 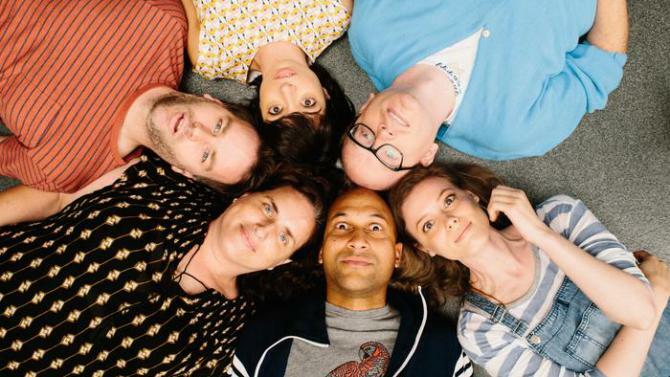 Samantha (Gillian Jacobs) and Jack (Keegan-Michael Key) are a couple. Allison (Kate Micucci) is a quiet woman who is working on a graphic novel. Jill (“Inside Amy Schumer” writer Tami Sagher) lives with her parents and is the only one who does not have money problems. And Bill (Chris Gethard) is making ends meet by handing out hummus and chips in the grocery store. “Your 20’s are all about hope. And then your 30’s are all about realizing how dumb it was to hope,” one character says. The group is presented with some bad news and some good news, two crises that expose the fragility of their connection. They are about to lose their performing space, and there are no alternatives they can afford. And Jack and Samantha achieve the most coveted of opportunities, the chance to audition for a television program that is the equivalent of “Saturday Night Live,” a sketch comedy show that is a major cultural institution. Both put enormous pressure on the group, and the sense of desperation, jealousy, and competition shatters their pretense of unity and endless support for one another. At the same time, Bill’s father becomes critically ill, which gives them a way to continue to connect. Birbiglia’s “Sleepwalk with Me” showed great promise. The transfer from stand-up to screen was awkward, but the atmosphere and the specifics of life on the road as a comedian were exceptionally well handled and he is on screen, as on stage, an engaging character. Here he once again takes us unto a very specific world that we can all relate to, especially when it comes to the way the characters use humor to reach a place of honesty. Birbiglia takes a risk here, making Miles less likeable, but it works as he very effectively creates real and vivid characters who have to figure out who they are when they are offstage. While the first film gave us one perspective, this one expands with a clear-eyed but generous take on each of them. So, the individual stories work and they provide balance and counterpoint. Even family members have to grow up, accept responsibility, and decide when to change course. Parents should know that this film has very strong language, sexual references and an explicit situation, rude humor, sad death of a parent, drinking and drugs. Family discussion: Why is it important to say “yes, and?” Is it sometimes hard for you to be happy when your friends succeed?